ALAMO, TX - A group of more than 600 people gather in silent protest on a levee at the Santa Ana National Wildlife Refuge Sunday, Aug.13, 2017 in Alamo. The group was protesting President Donald Trump's proposed Border Wall at the refuge. A rally and concert will be held Saturday near the Santa Ana National Wildlife Refuge in Alamo to commemorate the 75th anniversary of its establishment, as well as to protest the Trump administration’s plans to build a physical barrier on its land. 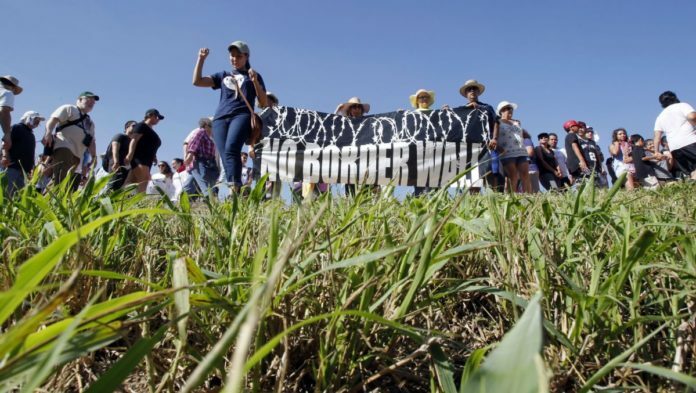 The rally, organized by members of the Lower Rio Grande Sierra Club and other local advocacy groups, is designed to raise awareness about the looming plans to construct walls on the levees on the refuge’s land — essentially creating a divide between the refuge and visitors center, and from the rest of the country. The event will be held just days after national media outlets reported that the president would propose a $25 billion price tag Monday for border wall construction along the U.S.-Mexico border — a sticking point for Trump on any deal to replace the Deferred Action for Childhood Arrivals program. The event, scheduled from 11 a.m. to 2 p.m. Saturday, will feature speakers, musicians and free food, as well as information on how attendees can take action against the wall’s construction. Expected at the event are U.S. Rep Filemon Vela, D-Brownsville, whose district includes Santa Ana; Efrén Olivares, the racial and economic justice director for the Texas Civil Rights Project; and Abraham Diaz of La Unión del Pueblo Entero, a local immigrant advocacy group. There will also be discussion on “the terrible impacts that border walls could inflict upon our communities and environment, and the border militarization that they are a part of,” the release states.